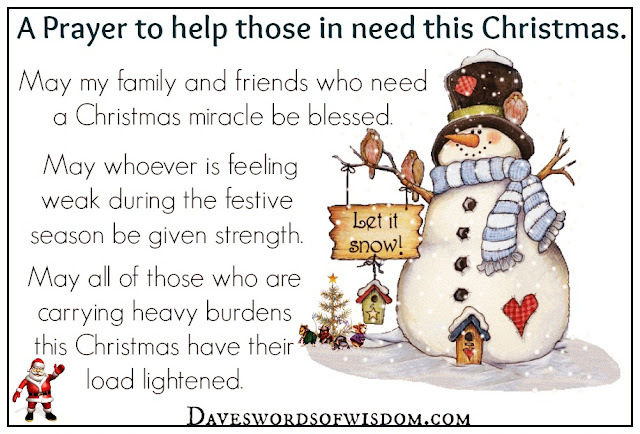 Daveswordsofwisdom.com: A Prayer to help those in need this Christmas. A Prayer to help those in need this Christmas. May my family and friends who need a Christmas miracle be blessed. May whoever is feeling weak during the festive season be given strength. May all of those who are carrying heavy burdens this Christmas have their load lightened. The power of prayer is strong - Share it! I love my family. I say a prayer for them every night. GOD BLESS THEM ALL.